I would say my creativity was born when I was very young, already as a “kaalvoet dogtertjie” (barefoot little girl) on a Karoo farm. One of 5 children. At least there was never a lack of initiative and creativity! I have my mother to thank for that extra splash of creative input in my life. She was the one who laid with us on a blanket on the grass and made us identify images in the formations of the clouds. She filled bottles with different levels of colored water, put it on the kitchen floor and we sat next to it and used spoons as “drumsticks” and found out how the levels of water influenced the sound. My dad is an eager gardener and we always had the most beautiful gardens, my mom let us create our own small gardens in corners where we used to play. I know when I am on the right track when an unexpected smile jumps on my face. (Haha!) I love this one: Don’t tidy your workspace, it’s chaos around me while I am busy with an artwork, references scattered on the floor, I do, however, clean up after the painting is done, only to start all over again, building up chaos to start “building” my new artwork in my mind and on canvas. Being more observant helps you to be more creative. 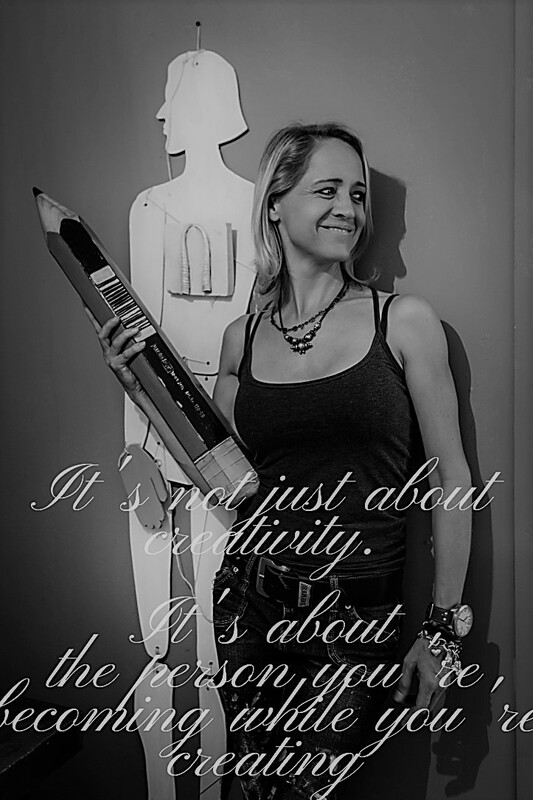 There are so many interesting posts on creativity on the internet, I found this one by Emily Johnson very insightful. I must say, I experienced how the area you are working in, have an impact on your creativity. I was in Mossel Bay for 3 years, I had a large studio there, and all these creative guys surrounding me who helped me at a snap of a finger to build stuff! I was like a fish in the ocean, growing bigger and bigger, now that I am working in a small corner in my living room, I feel restricted and my approach had to change. While I was building large whimsical furniture and did large paintings, everything got smaller. It’s like keeping a fish in a bowl, it will never get to be a large fish. But I do believe that you have to be able to adapt to your circumstances. You can still be as creative, the kind of art you create only changes. Never ever use a lack of space or resources holds you back. Just keep on keeping on, your creativity will start flowing freely out of your mind. 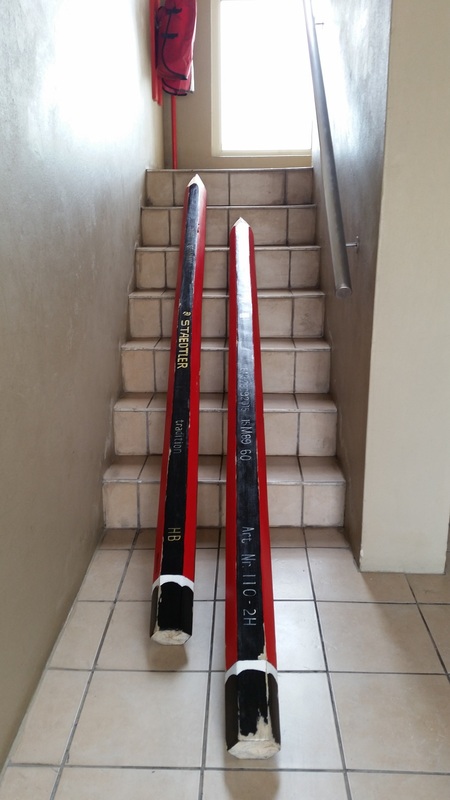 These two giant pencils was a commission by a client and I had Willi Fu Visser carved it for me, one of the very creative guys I used in Mosselbay to help me with my projects. I miss the time and the working space I had in Mossel Bay, oh my word, and the antique shops, the creating process, I loved every moment!! I did paintings on every object I could lay my hands on! This Paper Mache chameleon was made by Township Angles in Mossel Bay and I finished it off. 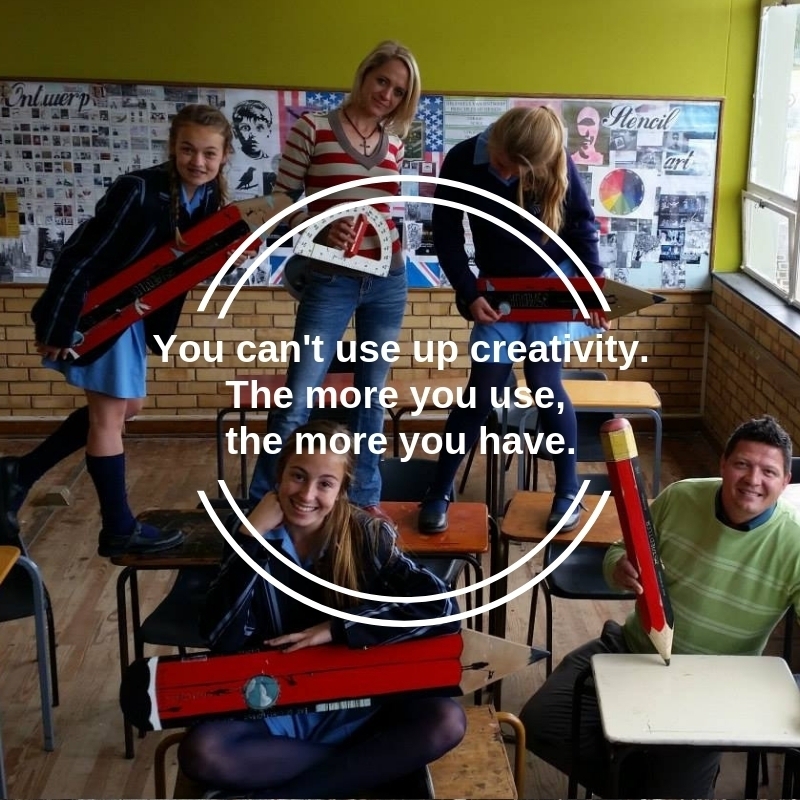 Posted in Blog and tagged Pencils, art, Mossel Bay, Quotes, Albert Einstein, Creativity, Township Angles, Nolte Lourens, Furniture, Studio, Creating, a way of life.